Cookbooks! My favorite type of gift to give and to get. There is nothing I love more than curling up on the couch with a beautiful cookbook to day dream of new dishes, desserts, and techniques to try. You, too? See, that’s why we are friends. Since it’s the giving season, I thought it would be fun to share some of my favorite gifting books and what I like to pair with them. My favorite way to gift a cookbook is with a kitchen tool that’s needed in many of the recipes. It’s a simple way to tie the gift together. Plus, if you’re anything like me, there is no such thing as too many kitchen gadgets. I recently bought this cookbook and besides the amazing recipes, I really appreciate how many beautiful pictures the Kitchn has managed to squeeze in. Besides 150 recipes, the book also includes 50 essential lessons and a guide to organizing your kitchen. I plan on gifting this to my “chef in training” friends along with these measuring cups that are pretty enough to be displayed on a counter. For the friend who is always trying to eat cleaner, consider the Oh She Glows Cookbook. This is my go-to book when I want to eat healthy, delicious food. Angela’s recipes are d0able and inspiring, just like her award-winning blog. To go with, I love these glass nesting bowls. I own two sets and use them on a daily basis. Perfectly stackable, they make prep-work a breeze. I like to think of this pairing as a dad gift. I don’t know about you, but my dad is the hardest person to shop for every year. If you haven’t had the chance to try Blue Bottle coffee, I’m sorry. A Bay Area staple, this is hands down the best coffee I’ve ever tasted. For my coffee-obsessed friends, I would include a bag of roasted beans with the Blue Bottle Coffee Cookbook. When I grow up, I wanna be Isa. This is the book. The book. Vegan or not, everyone loves this book. And I know I’ve been praising this book for an entire year, but it’s for good reason. The recipes are no-fuss, full flavor and packed with my favorite weeknight dishes. To date, I think I’ve gifted this book over ten times in the past year, and it’s always a winner. Since cast-iron pans are a must for perfectly cooked tofu, Isa Does It and a cast-iron skillet is my favorite gift pair on this list. Sweet Tooth friends, I haven’t forgotten about you! While this book is a raw vegan dessert book, none of that matters once you taste Emily’s recipes. This un-cookbook is perfect for the friend who would rather have a brownie than a piece of pizza. Since Springform pans are used heavily in raw “baking”, I added them to the sweet treat gift pairing. As a vegetarian, I am often asked what my favorite resources are for new vegetarians. Gosh, I remember those days. While there are so many great books out there these days, Meatless by Martha Stewart is one of my favorites. Heavy on picture perfect recipes that will help the transitioning vegetarian or any omnivore who wants to include more meatless meals in his/her diet. Of course, with all that vegetable prep, a pretty paring knife would go great with this book. Salad lovers! I have a book for you! It’s no secret that I love salads, and this book further cements how many ways you can make a delicious, filling salad. Just like Isa Does It, you don’t have to be vegan to love this book. A bamboo salad bowl and this cookbook is a fun way to share the salad love with friends. 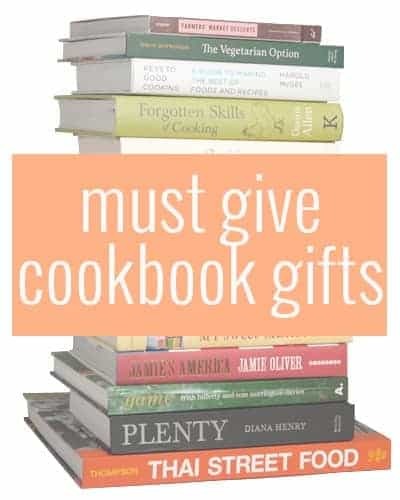 Now it’s your turn- what cookbooks do you like to gift? You have to check out the thug kitchen cookbook. It’s a vegetarian book that has a blunt sense of humor perfect to get somebody in the kitchen who might not have wanted to cook before. The pics are beautiful and the recipes are amazing. Plus it’s just a hilarious read even if you don’t cook from it. Can’t wait to try some of these other books you’ve listed! Ah! I know! Thug Kitchen is actually on my wish-list this year for the holidays. I LOVE the blog and can’t wait to see the cookbook! Thanks for commenting! I am SO jealous that you have eaten at Modern Love! Don’t know how much times I have looked at flights to Omaha for that reason alone 🙂 It’s by far my most loved cookbook, amazing that I’ve owned it less than a year! My dad has 298372424983 billion cookbooks, when I go home for XMAS – I shall look at ALL of them, because I will be bored as hell! LOL! haha I LOVE cookbooks! I bought myself another one last night (I’m a cookbook hoarder for sure.) and read it cover to cover. I need to come to your dads house! One of the best gift guides I’ve seen this year! Who doesn’t love cook books?! I especially love how you paired them with kitchen gadgets. I’d love to see any of these under my tree this year. I love the pairings of cookbooks with cooking tools! I just did the same for cocktails for my husband! It’s a fun and fabulous gift! Thanks Jessica! Me too! it’s my favorite way to gift them!